Following the overwhelming success of the SUR/FIN Asia-Pacific, held in Singapore in 2012, by popular demand a second SUR/FIN Asia-Pacific Exhibition and Conference will be held at Biopolis in Singapore in the period December 9th- 12th 2014. A unique and truly International conference for surface finishers worldwide, but clearly focused on South East Asia. The technical conference will run with parallel sessions and cover two complete days. 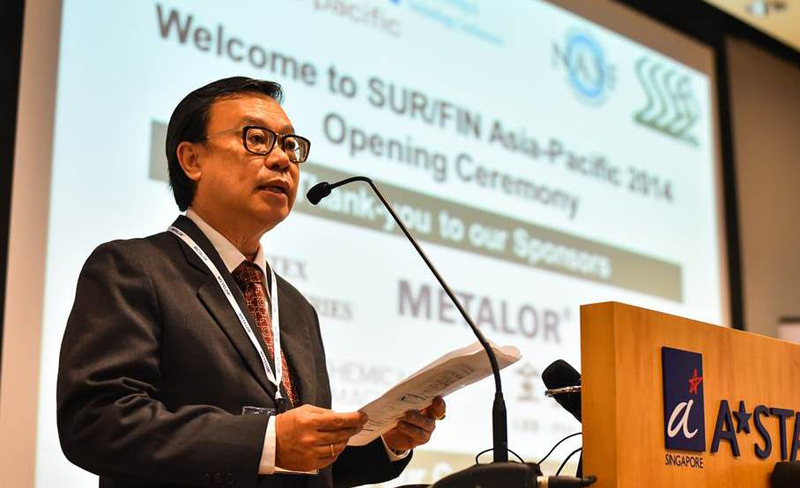 Now is the time to take action and plan your participation in SUR/FIN Asia-Pacific 2014.This event is the only South East Asia event dedicated to Surface Finishing, Surface Engineering, Surface Coating, Electro-plating and Precision Engineering covering the full spectrum of industries located in South East Asia. Welcome all of you to our new website and the coming SURFIN ASIA PACIFIC 2014 EXHIBITION & CONFERENCE to be held in Singapore at the Biopolis from 9th Dec to 12th Dec 2014. This bi annual exhibition and conference is jointly organized by National Association for Surface Finishers (NASF) of USA and Singapore Surface Engineering Association (SSEA) with the support of National University of Singapore (NUS) , Singapore Institute of Manufacturing Technology (SIMTECH) and other organisation. We are indeed encourage by the overwhelming success of the exhibition and conference held in 2012 and strongly recommend your participation in this coming event. All the information regarding the exhibition and conference is at your fingertips and just go to our website at www.aseansurfin.org and you are on your way to a fruitful exhibition and conference right here in Your Singapore! SUR/FIN Asia-Pacific 2014 is being held at Biopolis which is a 15 minute taxi ride from the Orchard Road area of Singapore so all Hotels in this downtown region of Singapore are a convenient location. The nearest and recommended Hotel for SUR/FIN Asia Pacific 2014 is Park Avenue Rochester which is situated a 10 minute walk away from Biopolis adjacent to Buona Vista MRT Station. Don`t Delay: Reserve your Exhibition space NOW ! This event will sell out fast please contact our Secretariat for details of available space. There will be a number of education courses full details are in the website under "Courses" above.